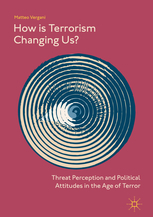 This book examines how the perception of terrorism threat erodes civil liberties, sows doubt about the loyalties of immigrants, and heightens the left-right ideological divide. The book presents original analysis of survey data and experiments conducted in Australia, Europe and the United States. Research in the book posits questions that others have largely avoided: How does the threat of terrorist violence undermine multicultural democracies? What are the psychological and social mechanisms that explain how the threat of terrorism can change political attitudes? What is the relationship between terrorism and death threats? What is the role of media in shaping the perception of terrorism threat? And what are the ethical responsibilities of journalists? This book will help readers distinguish between groundless speculation and solid scientific knowledge of the topic. Moreover, it provides concrete recommendations on how to prevent the most negative consequences of the polarization of political attitudes, such as social divisions, exclusivism and conflict. Given the broad geographical scope of the research presented in the book, specifically North America, Europe and Australia, this book will appeal to broad scope of readers.